Here are a few maps of Kingston, from 1795 to 1903, that show identifiable buildings. Links will open or download a pdf map, depending on your browser. Some of these scans have been copied from other sites or have been isolated from atlases; both the sources and the full volumes are linked in the description. See more recent Kingston maps and the online GIS on the Town’s website. 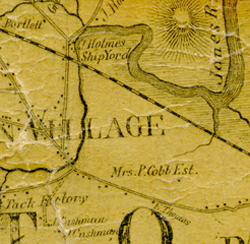 The Town of Kingston and the Village (center of town), two details from "Map of Plymouth County," by Henry Francis Walling, D.R. Smith & Co., Publisher, 1857. A copy of this large wall map hangs in the Selectman's Office at the Town Hall. The Library of Congress has a digital copy here. "Map of the Town of Kingston," E.N. Boyden, E.B. Stillings & Co. Publisher, 1876. The numbers on the map refer to this "Key to the Map" listing owners and occupants, which can be searched in this transcription . The Town of Kingston; the Villages of Kingston and Rocky Nook; and Residences, three images from the Atlas of Plymouth County, Massachusetts, Justin Winsor. George H. Walker & Co., Publisher, 1879. Scans are from this atlas*. Bird's-eye "Village of Kingston," A. F. Poole, Publisher, 1885. Scan from the Norman B. Leventhal Map Center. Boundaries of Kingston, Topographical Survey Commission, 1889. The scan is from the full volume*. Town (Plate 11) and Village (Plate 13) from the New Topographical Atlas of Surveys: Plymouth County, L. J. Richards, Springfield, Ma., Publisher, 1903. Scans are from the full atlas*. Map of Evergreen Cemetery, 1914, updated 1941. For lookups by name, please use the form on the Cemeteries page. Items marked * are from the State Library’s amazing collection of Real Estate Atlases.